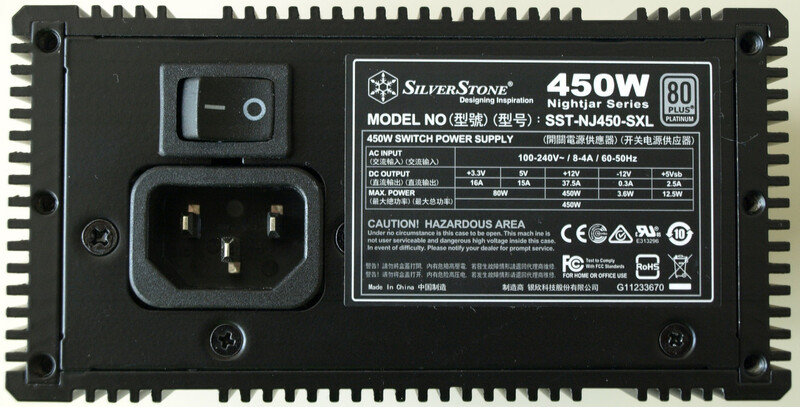 Silverstone has been in the fanless PSU market for well over 8 years. So how have things changed since then? Is Silverstone still a worthy option for fanless PSUs? We’ll find out with a detailed look at the Silverstone Nightjar 450 W, which is not only fanless but also designed for mini ITX cases. Not having a fan makes the thermal design much more of a challenge with the small size making things more difficult still. Therefore, it’s no surprise to see that the designers targeted an 80 Plus Platinum efficiency level to ensure less heat is created in the first place. On the side of the box are the specifications, which are about what’s expected for a 450 W PSU. The only thing that stands out is the weight at 1.52 kg or 3.34 lb – quite heavy for a 450 W PSU. For those interested, the Silverstone website has a few more specs like power density at 436 W/L, but all specs that a user is likely to care about are already on the box. 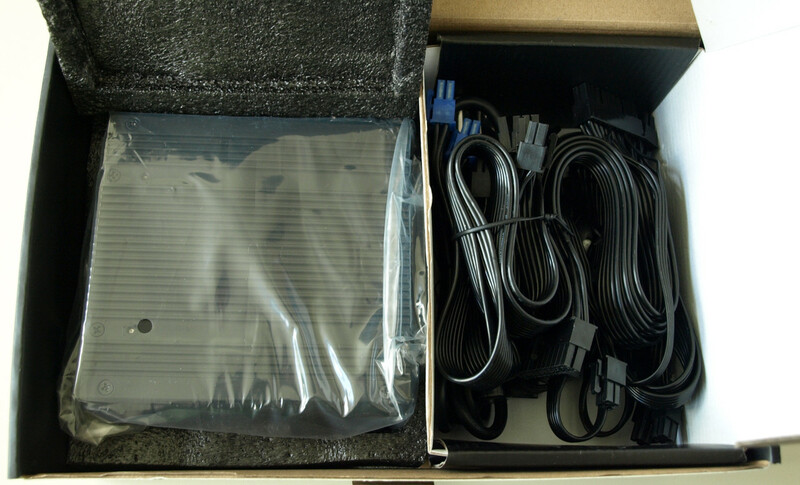 Opening the box, we find the PSU itself under some foam padding and a smaller box with the cables. Although it is normally not useful for the ATX cable to be removable, in a mini ITX system where space is at a premium, it opens the possibility of having a custom cable to exactly fit the case. 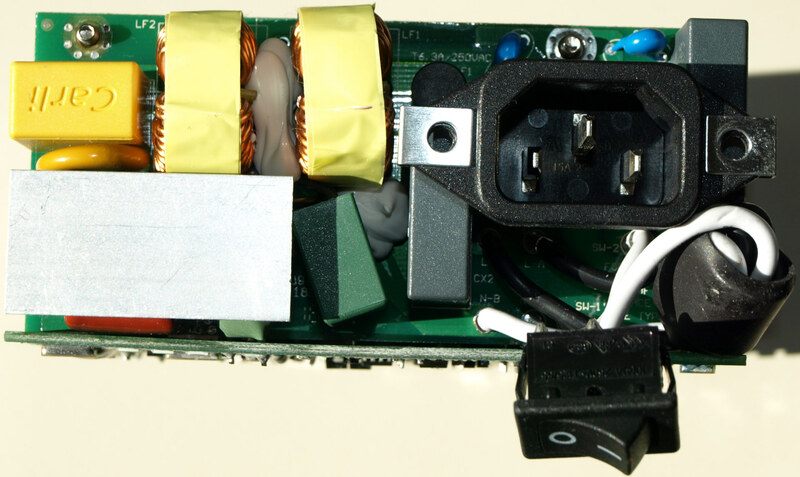 The EPS12V cable being removable is even more useful since there are few fanless PSUs available for mini ITX cases and therefore it’s reasonable for such a PSU to get used in a PC that doesn’t have an EPS12V connector. 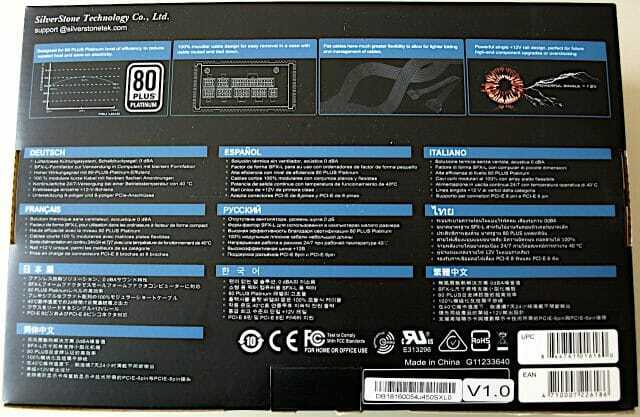 What puzzles me is why they included GPU cables that exceed what the PSU is capable of supplying: four 8-pin connectors for a total of up to 600 W. My best guess is the cables are also used on their larger PSUs and it was cheaper to just use those instead of manufacturing a different kind just for the smaller PSUs. The generous spacing on the SATA cables can make them hard to fit into a crowded case, so I would have preferred to see one plug at a generous spacing for an optical drive and the rest spaced just right for a stack of 2.5″/3.5″ HDDs. The back side has the AC input and the service switch. Since there’s no fan to give an indication it’s running, I would have liked to see a LED just like on the older version. (Not too bright, however; a diffused green LED would be ideal.) There’s also the specification label. 15 A on the 5 V is normally on the low side, but this PSU is intended for a mini ITX system that generally has fewer USB ports and SSDs than larger PCs. 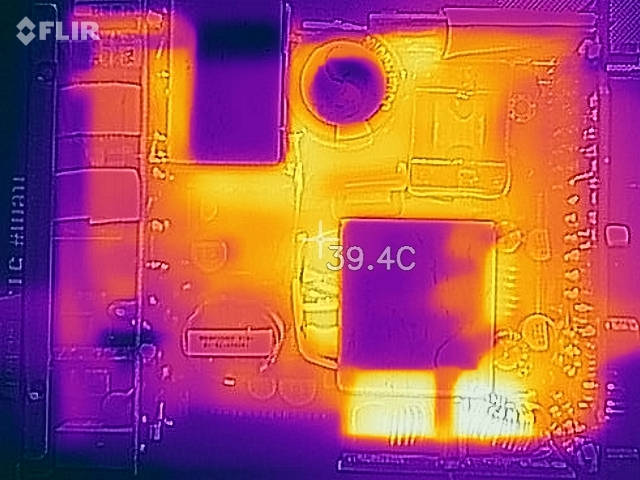 37.5 A on the 12 V is plenty for virtually any silent PC, even more so after accounting for the inherent thermal limitations of a compact build. 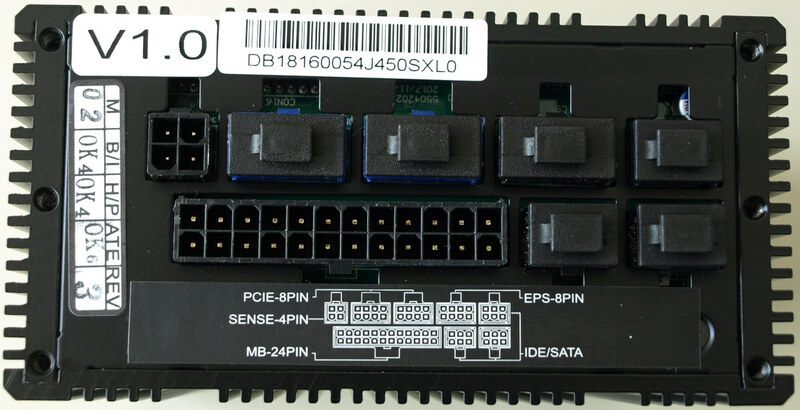 The front side has the DC connectors with the optional ports capped. Since there’s no fan, the other four sides of the PSU are covered in heatsinks. Here we see the big flaw with an otherwise great idea: as designed, the PSU gets the best cooling when either the front or back side is facing up, which is a very unlikely orientation in practical use. Turn the fins 90° and the cooling will be much better in the horizontal or vertical orientations it will likely be used in. 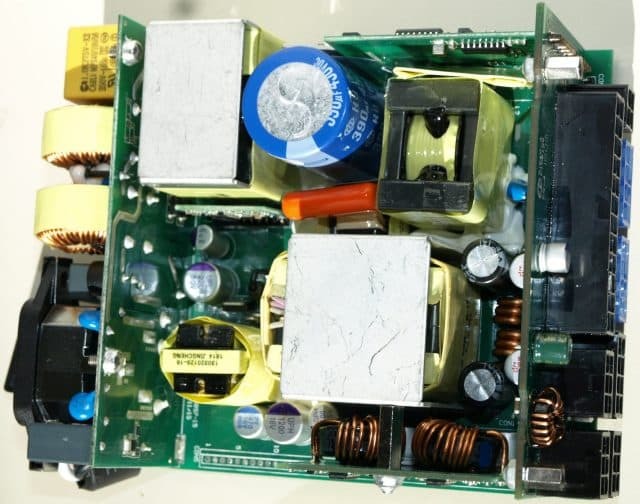 Tearing down this PSU took a lot longer than usual thanks to its unusual construction. That, along with the usual high voltage hazards, is a good reason to leave the teardown to an experienced engineer. 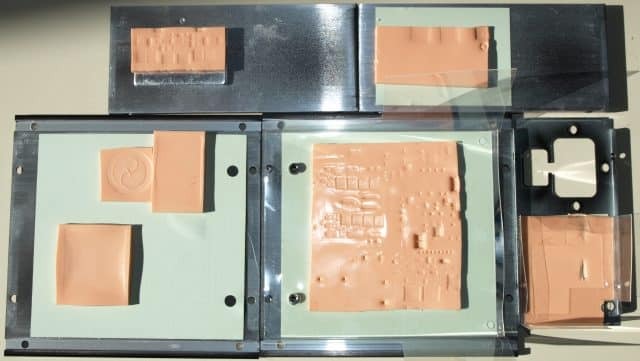 The first thing we see is the heatsinks that make up the sides, top, and bottom of the enclosure, complete with thermal pads to couple them to the electronics. 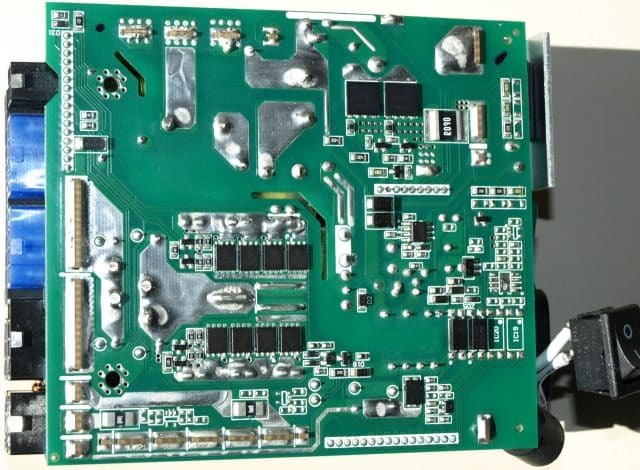 With the heatsinks out of the way, we see six PCBs: the main board, the AC input board, the DC output board, the main PWM board, the PFC control board, and the voltage regulator board. Something interesting to note is that there is space to accommodate a much larger voltage regulator board, presumably a version for a NAS that needs more current at 5 V and 3.3 V for a large number of hard drives and/or support for a redundant PSU configuration. The AC input board has plenty of filtering and doubled up bridge rectifiers. The white wire on the switch suggests it’s switching the neutral, a fear confirmed with a quick multimeter check. Any competent electrician will give a lecture on why a switch in the neutral is a bad idea, but one reason that is easily overlooked is that when the switch is in the “off” position, the entire stray capacitance of the PSU will appear as leakage to ground. That, in turn, can cause really confounding problems with GFCIs/RCDs such as tripping when the switch is turned off or increased sensitivity to noise due to the added capacitance between hot and ground. The PFC is based around an AT6101L digital PFC controller, two IPL60R104C7 MOSFETs, and a C3D08060A rectifier. The 5VSB is based around an AT6002H PWM controller. Eight BSC014N04LS MOSFETs rectify the 12 V. Some of the solder joints appear to have voids and cracks. The main PWM is based around a CM6901 PWM controller, a SI8230BD dual gate driver, and two IPP50R140CP MOSFETs in a half-bridge topology. 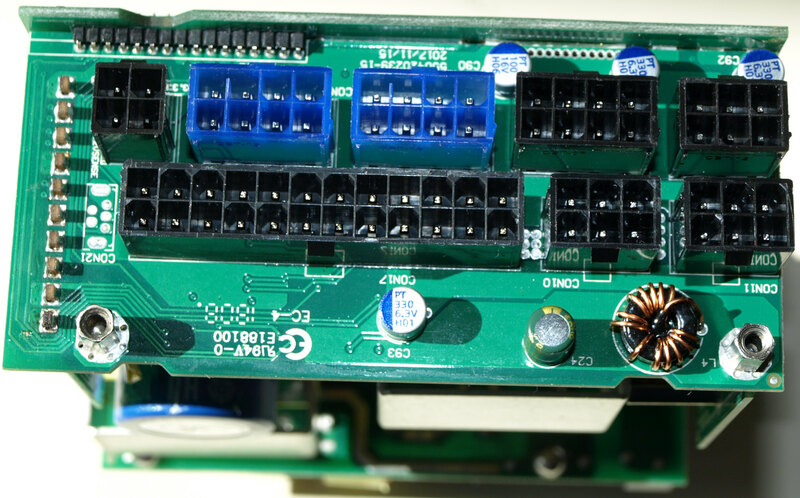 Two APW7160A buck controllers, two BSC050N03LS MOSFETs, and four BSC018NE2LS MOSFETs on the voltage regulator board handle the 5 V and 3.3 V.
A PS223 handles the protection. Also visible are several capacitors for ripple reduction and an inductor for the 5VSB rail. The standby power usage is extremely good at 0.07 W. Measuring the idle power usage proved difficult because the PSU very aggressively period skips at no load, causing the reading to bounce between near zero and around 7-10 W. Some data collection using the Mooshimeter eventually extracted a very good average of 3.8 W.
Under load, the efficiency measures excellent, exceeding 90% at about 150 W of load. The ripple measurements are excellent as well with 5.97 mV on 12 V, 3.88 mV on 5 V, and 7.37 mV on 3.3 V. Of particular note is the exceedingly low ripple on 5 V, since USB devices such as external sound cards are powered from that. That’s great news for recording studios where minimizing electrical noise is just as important as reducing acoustic noise. 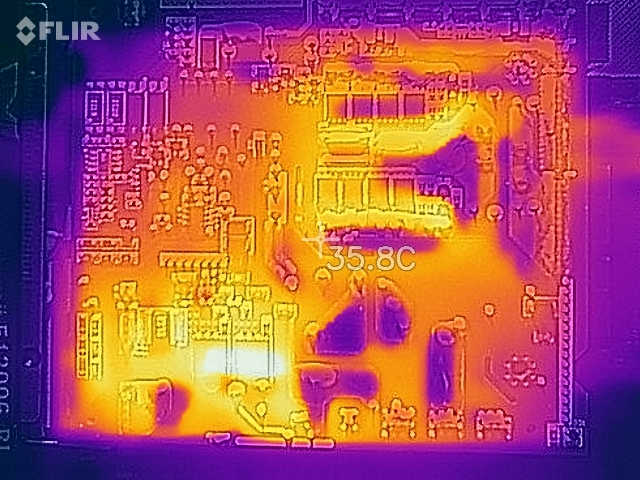 The thermal images show that most of the losses are in the PFC MOSFETs and voltage regulator inductors. 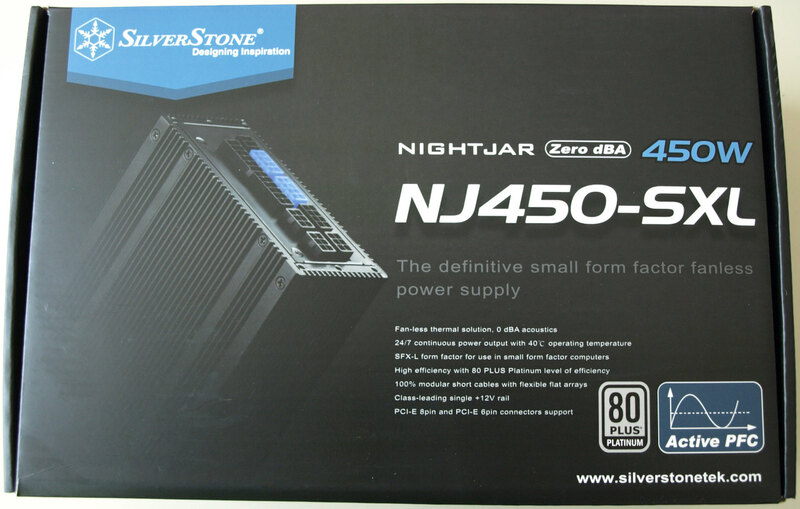 Priced at $190 (Amazon), the Silverstone Nightjar 450 W is among the most expensive 450 W PSUs out there. However, there’s also very little in the way of fanless PSUs for mini ITX cases with the nearest competitor being PicoPSU, but that’s also considerably lower power. With that in mind, having so few options, a price premium was almost a given. Efficiency is excellent, it’s silent acoustically, and extremely quiet electrically. Silverstone even went through the effort of using digital PFC with aggressive period skipping to raise the efficiency at low power levels where silent PCs tend to operate at. Where it matters, it’s almost perfect. Definitely a top pick for use in a recording studio or anyone who wants/needs silence 100% of the time. The selection of components is decent, but there are a few minor design flaws like the heatsink fins facing the wrong way and the switch switching the neutral. A few build flaws like the soldering quality also warrants that Silverstone review their manufacturing process. All in all, it’s an incredibly niche product. 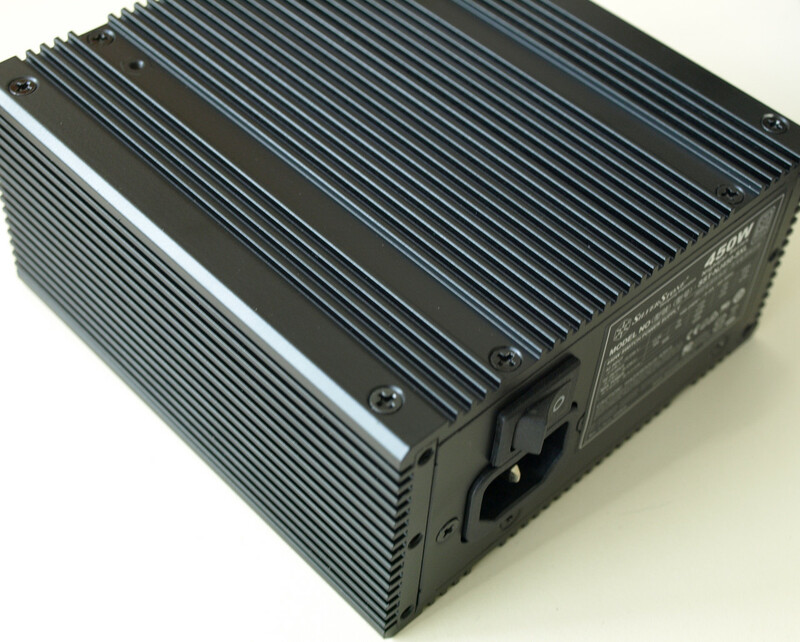 Most users looking for silence can get better value with a PSU that has a fanless mode, but isn’t always silent either. Small size and silence are goals that tend to run counter to each other. But, if a compact fanless PSU really is the best fit for your use, the Silverstone Nightjar 450 W pretty much gets it right. Next Article ASRock Z390 Extreme 4 Motherboard Review: Price/Performance King Again?